This comprehensive collection of top-level contributions provides a thorough review of the vibrant field of chemistry education. Highly-experienced chemistry professors and education experts cover the latest developments in chemistry learning and teaching, as well as the pivotal role of chemistry for shaping a more sustainable future. Adopting a practice-oriented approach, the current challenges and opportunities posed by chemistry education are critically discussed, highlighting the pitfalls that can occur in teaching chemistry and how to circumvent them. The main topics discussed include best practices, project-based education, blended learning and the role of technology, including e-learning, and science visualization. 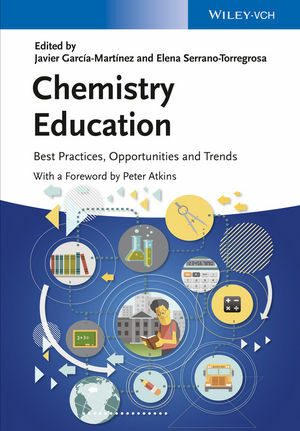 Hands-on recommendations on how to optimally implement innovative strategies of teaching chemistry at university and high-school levels make this book an essential resource for anybody interested in either teaching or learning chemistry more effectively, from experience chemistry professors to secondary school teachers, from educators with no formal training in didactics to frustrated chemistry students. Javier García-Martínez is Faculty member and Director of the Molecular Nanotechnology Lab at the University of Alicante, Spain, where he teaches at undergraduate and graduate levels, and created several courses on materials chemistry and nanotechnology. Javier has published extensively on chemistry, materials science, and nanotechnology and is inventor of more than twenty fi ve patents. He is Co-founder of Rive Technology, a VC-funded MIT spin-off commercializing hierarchical zeolites for energy applications and a fellow of the Royal Society of Chemistry, member of the Global Young Academy, the World Economic Forum, and of the Bureau of the International Union for Pure and Applied Chemistry. His latest books are "Nanotechnology for the Energy Challenge" (Wiley, 2014) and "The Chemical Element" (Wiley, 2011). Elena Serrano-Torregrosa is a Research Fellow at the Molecular Nanotechnology Lab of the Inorganic Chemistry Department at the University of Alicante (Spain), where she has been teaching since 2009 and has created several courses on nanotechnology. She received her PhD in 2006 at the University of Basque Country, Spain (Iñaki Mondragón). After a post-doctoral activity at the National Institute of Applied Sciences, INSA in France (Jean-Pierre Pascault), Elena joined the Molecular Nanotechnology Lab at the University of Alicante in 2009. Her current research interests are in the area of new synthetic pathways to prepare photoactive hybrid titania-based materials, in which she is working for three years. Her last book is "The Chemical Element" (Wiley, 2011).